In a panel discussion on Nov. 13, seven distinguished journalists from a variety of news outlets presented their differing views on the continuing importance of community journalism and potential methods of funding it. 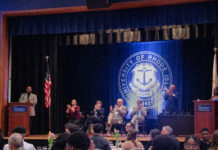 The discussion, “How Can Community Journalism Survive in Rhode Island’’, was held to commemorate the University of Rhode Island’s annual Journalism Day, sponsored jointly by the Rhode Island Press Association, the school’s journalism department and the Harrington School of Communication and Media. Following a series of morning workshops discussing journalistic ethics and new methods of digital storytelling, the discussion featured varied and often conflicting views on the steps local news organizations should be taking to stay relevant and profitable in the world of online journalism. Moderated by “Newport Daily News” executive editor Sheila Mullowney, the panel was held at noon in the Memorial Union ballroom. Tim Cotter, managing editor of “The Day” in New London, Connecticut, stated that he is optimistic about the survival of local journalism due to the lack of small town coverage he sees from larger outlets like the “Providence Journal”. Fellow panelist Brian Jones, founder of the “Rhode Island Library Report” and past “Providence Journal” reporter, said he was shocked to hear about the lack of coverage from his former paper. Jones noted that during his 35 years at the “Journal”, the paper had 13 bureaus throughout Rhode Island and Massachusetts and printed seven local editions. He agreed with Cotter’s comment that large news sources are no longer able to provide adequate local coverage. “I am not optimistic about whether we can ever regain the huge newsgathering organizations that I was privileged to be part of,” he said. Also optimistic about the future of local news, “The Westerly Sun” editor David Tranchida brought up what he refers to as the “refrigerator door” factor. Tranchida argued that the placement of such information in a local paper is more than just an ease of access. Scott Pickering, the general manager of East Bay Newspapers, disagreed with the idea that the “refrigerator door” factor holds much weight after the advent of social media. One suggestion Pickering offered to new journalists was to ignore less interesting stories in order to focus on more eye-catching news. Pickering suggested that reporters might choose not to attend every zoning board meeting if it doesn’t appear to be newsworthy. Jones disagreed with Pickering’s suggestion, explaining that attending every meeting is a required part of discovering the more interesting stories. Jones cited the BBC as an example of a great government-funded news outlet. Pickering disagreed with the idea, citing the differences between the U.S. and U.K. governments. Pickering was also critical of the idea of grant-based journalism. Overall, the panelists agreed that while the future is uncertain when it comes to funding small news operations, the necessity of local news coverage will never cease to be a necessity.